The weather is getting better in Bangalore, some rain in the evenings has brought down the temperature a little. Because of the heat, I didn't feel like baking at all, the heat from the oven made it even worse, but now I can do some baking, at least some bread. 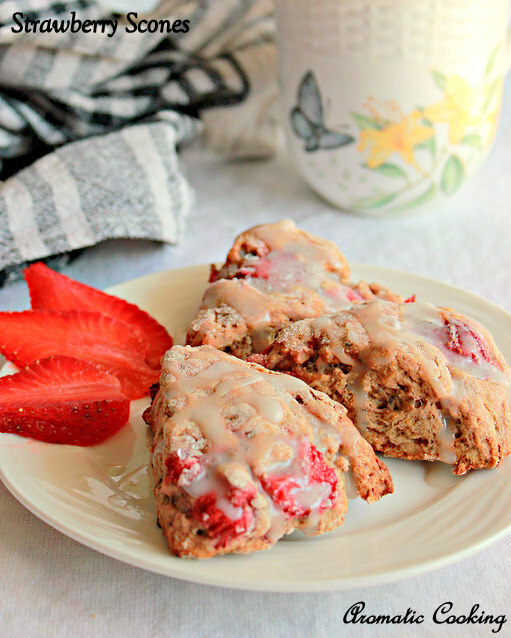 These Strawberry Scones, I had actually baked them long time back, on a weekend for breakfast. For those of you, who are not familiar with scones, they are like biscuits, mildly sweet, not soft or spongy and at the same time not very hard, they will have a crumbly texture. They can be had as such or served with some butter or any fruit sauce or jelly or with a simple glaze on the top. Usually it's made with plain flour or self rising flour and with eggs, but I have used only whole wheat flour and made it eggless. Since I had added very little sugar, they were not that sweet and a little dense ( because I had used only whole wheat flour ), but when served with some sugar glaze on top, they tasted perfect..
Soak the chia seed powder in 3 tablespoons water for about 10 minutes. Sieve together the whole wheat flour, baking powder and baking soda, mix in the sugar and salt into it. Slice the strawberries and keep. Now add the butter to the flour and using two knives or pastry blender, mix it with the flour, I used my fingers, till the flour has a crumbly texture. 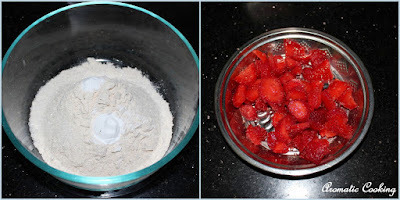 Add the strawberries and chia seeds and bring it all together into a dough. Dusting some flour, pat it down into a thick circle, then slice them into wedges. Using a wide spatula, remove them carefully and place on a baking tray lined with parchment paper. Brush the top with some milk and sprinkle some sugar. Bake it at 190 C for about 15 to 20 minutes, till it turns golden. Serve them warm. For the glaze, mix in the sugar with milk, drizzle it over the scones. Check out my Eggless Blueberry Scones here. Don't knead the dough too much, the strawberries will start releasing the juices and the dough would become a wet lump. Oven timings vary, so keep an eye after 15 minutes. You can use a half and half mixture of plain flour and whole wheat flour. What a healthy scones hema. 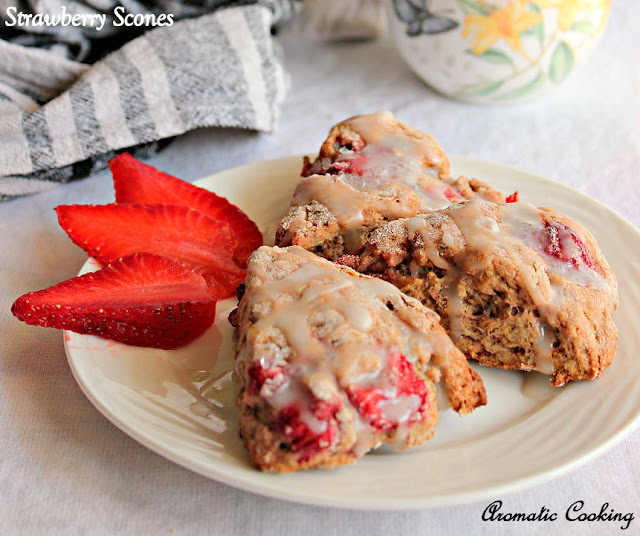 Loved the addition of strawberry,chia seeds and whole wheat flour. These eggless scones look wonderfully delish and full of good health, Hema. They look GREAT with fresh berries!